Tranalyzer2(T2) was created at a swiss operator out of the need that standard cisco netflow did not supply the fields we needed for our troubleshooting and security work. We needed all kinds of encapsulated protocols, content info, advanced statistics and an easy way to extract information for traffic mining. And most important a tool which can digest really large pcaps and runs stable on an interface. Therefore, only code and functionality which is needed by the user is added. That should explain, why a lot of T2 is controlled by compiler switches, making it adapable and lightweigth. But no worries, we made compiling on different infrastructure easy for you. Having also students with us, we saw they always reinventing the wheel when it came to traffic analysis, so in 2008 T2 became open source. Since then practical ideas from people working in the field and in research inspired the path of the Anteater. This tutorial will teach you about the basic configuration, usage, basic plugins and post-processing philosophy. So, let’s first look at the basic protocol and output modes. By default since the 0.8.0 version T2 operates concurrently in all protocol modes and feeds output into the same files. If you are only interested in IPv4 and decapsulation of protocols such as L2TP, GRE, IPvxinIPvy, etc is not relevant, T2 can easily be configured to do only this. Moreover L4 protocols support is supplied e.g. SCTP which transforms all streams into extra flows, if enabled in networkHeaders.h. We will discuss at the end of the tutorial and in the T2 Kungfu (coming soon). T2 is capable to produce the following concurrent jobs. Lets have a quick look at these. The packet mode’s output format is as scripting friendly as the flow output and thought as a drill down instrument, which links back to flows and L7 content via the flowIndex. We will discuss it in detail in the tutorial packet mode. Network managers often need certain time sampled parameters, such as number of packets or bandwidth. T2 reports into standard tools. All aspects will be discussed in the tutorial monitoring mode. To get started download Tranalyzer and unpack the tar ball: (BTW: lm means linux, mac tested.) and for the uninitiated bash user, the $ in front of each command denotes the bash command line prompt. Do not copy it into your command shell. You see the link to the documentation, the README (compilation, dependencies for different OS), the setup script and the trunk, which contains the Core, plugings and scripts. If you are a rookie to T2, use the setup.sh script, it will install all tools, links and environment variables for you and compile T2 with the standard basic plugins. If the setup finished successfully you are all set. A other good and old fashion way without ./setup.sh is to move to the trunk and invoke ./autogen.sh. t2 always points to the newest tranalyzer compiled under ~/tranalyzer2-0.8.2/trunk/tranalyzer/src, so you do not need to move to this directory and type ./tranalyzer. If compilation fails, it will tell you what is missing, then refer to the README or copy the appropriate dependencies from here. If nothing works, look under faq. if that does not solve your problem write to the Anteater. He will definitely help you. -r PCAP      Read packets from PCAP file or from stdin if PCAP is "-"
appended, e.g., 10Kf, then SIZE denotes the number of flows. If you cannot wait and like to try it now on an interface, go ahead and use the -i option. Here we will read from pacps, so the -r, -R or -D options are relevant. While the latter two are only being used if more than one pcap is to be analysed, for this tutorial -r is option of choice. The -w option defines where the flow files will be written to. If you omit -w T2 writes to the folder of the pcap. The rest is currently not important. and create a separate data and results directory, which is good practise for analysis and mining jobs. T2 produces an end report, which serves as an initial assessment of the pcap content and anomalies. Aftger basic packet, byte statistics each plugin adds some stistical or hex coded info between the —- lines which will be discussed later. Moreover flow based statistics will is supplied to assess the traffic seen on the wire. At the end certain protocol based info and warnings about traffic content will be supplied to alert the user. Thus, an initial assessment is possible without even looking into flows or packets which is essential when dealing with large quantities of traffic. All plugins reside under trunk and own a src (.h,.c), doc (.tex,pdf) and test (autotesting) directory. Important for now is the doc, where you will find a pdf describing the plugin or you look at the global trunk/doc/documentation.pdf. The rest will be discussed later. To give you a basic introduction to the traffic mining art using tranalyzer is the primary goal of this tutorial, so lets start with the very basics; have fun! T2 produces an end report, which serves as an initial assessment of the pcap content and anomalies. Each plugin adds some info between the —- lines. BasicStats tell you about the biggest talker regarding traffic volume, which is one of the first features which is relevant for understanding large traffic pcaps. There are also biggest talker in regard to number of connections. We will come back later to that topic under chapter Simple example for Graph output. So its an old pcap from 2002 afternoon, ipv4/6 + ethernet traffic and the payload is snapped. At the bottom, you see [WRN] and [INFO]. It is decoded from the Aggregate flow status, which denoted the ‘ored’ info from all flows. There are packets snapped down to the L3 header, framgments without header, or end. The difference between the snapped bandwidth and the full raw bandwidth denotes that either the snaplength was small, maybe the default, or somebody actually mangled with the packet content. The average packet load is symmetric for A and B flow, very odd. The protocols being used indicate that the traffic is either corporate or the wild. So if you want good traffic with content for your job, I wouldnt trust that pcap. You can extract way more info, which we will do in the tutorial T2 Kungfu. The header file contains information about the columns of the flow file, such as name, column position, T2 config, pcap file, etc This information makes it easier to reproduce results from different experiments and it is good doc. # Tranalyzer 0.8.2 (Anteater), Tarantula. Now compare it with the flow file, the first flow flowInd 6 is printed below. Until l4Proto the columns originate from basicFlow. After that until bytAsym is basicStats. I picked some interesting flows which demonstrate T2 ops when traffic is mangled with. To extract flows you can use any combination of columns in the flow file. If you don’t like tabs as a separator, change “” to any character in utils/bin2txt.h and recompile txtSink. Nevertheless, tabs are standard separators in most of the bash tools. A single A Flow can be also the answering flow if the flowStat bit 0 is set. T2 sets this bit according to L4/7 info to the best of his knowledge. We will come back to that topic when discussing icmp flows. Play around a bit and you will discover how easily it is to select flows in question. If you only deal with IP and are only interested in simple Netflow5 output, just cd trunk or use tran, a bash alias. and here you have your netflow5 output. and flowInd and flowStat are gone. There are more tricks with tawk, being discussed in the Post processing with TAWK tutorial. So you can switch off the RTT estimation, calculation of checksums, the tcp windowsize features or the tricks with tcp seq/ack numbers. Although fragmentaiton in IPv4 today is mostly fishy, if you are not interested switch it off. The code becomes then smaller and faster. Lets go over the most important fields you need to understand for a start. There are still OS which increment the IPID by 1. This is a formidable feature to detect the load of a machine. Hence, T2 provides ipMindIPID and ipMaxdIPID column which denotes the min/max difference of IPIDs between packets. 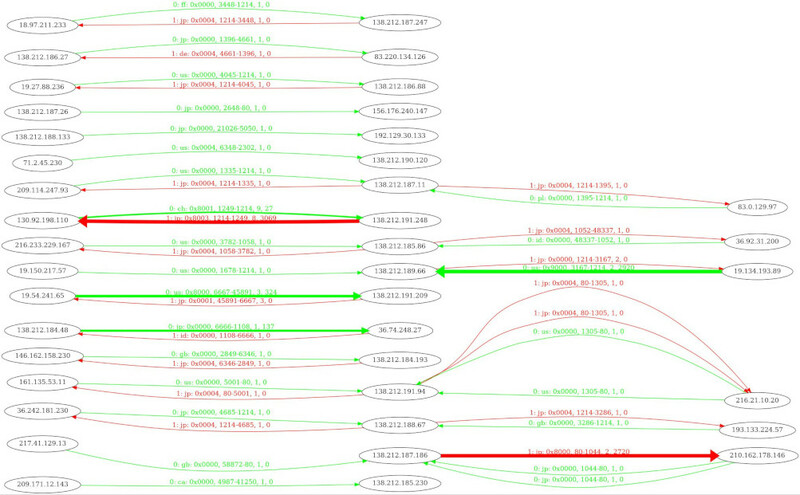 If the differences are large and we are sure of the 1 increment, several connections from that IP distribute packets. So, every connection will have jumps / flow. The ipMin/MaxTTL gives you an indication how far your sniffing tap is from the senders IP address and whether several routing paths are involved. tcpAnomaly contains flags of combination of flags and abnormalities about sequence numbers. To acquire an overview about networks and their communication a graphical output can be helpful. graphviz is a wonderful program to produce al kinds of graphs. T2 supplies a conversion example script grphvz which you may expand for your own purposes. flowStat direction bit, land of origin, tcpAnomaly, srcPort-dstPort, pktsSnt, bytesSnt. So apply the already generated flow file to grphvz, convert the resulting .dot file to jpg and display it with eog or better feh. You may also use the interactive program dotty. If we had the full traffic plotted then you could identify large or biggest talkers, just by looking for the arrow with the largest width. But, note that with larger number of flows the performance of graphviz dot degrades rapidly. We produced a netgrapher which can handle very large connection matrices. Unfortunately this is not open source. If you are interested contact us here. Another method to find biggest talkers is to reverse sort with tawk. Note that the number 4 in the tawk statement below denotes the number of lines to display. If you omit it, all lines will be displayed. After inspecting the T2 end we have a good overview about the pcap state, certain abnormalities and statistics. As each network has its specific protocol statistics, T2 provides several global plugins which produce specific protocols statistics. protoStat and icmpDecode are standard to be scrutinized after inspecting the endreport. 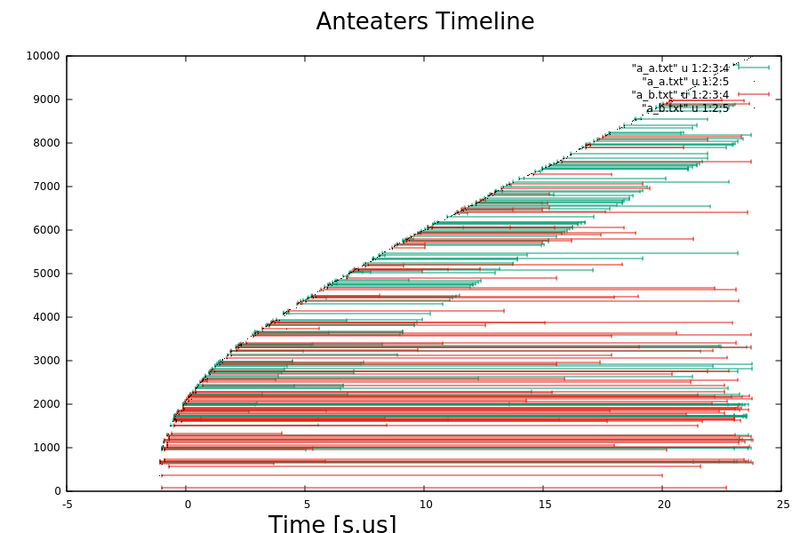 protoStat generates annoloc2_protocols.txt which is sorted according to Layer2-4 protocol numbers. Here as well the biggest protocol talker is interesting to begin an analysis. The script protStat sorts the protocols file according to number of packets. The -p option defines the lower limit of probability to display, we selected 1%. We have 0.25% icmp traffic, which is not abnormal for that type of traffic. Often it is necessary to look at the icmp messages in detail because some may indicate problems or even malicious behaviour. The bitfields are useful for selecting flows, but if you like a bit more human readability, set **ICMP_TC_MD* to 0, recompile and rerun T2. In the flow file below you will now see from the macRecorder plugin all mac addresses including packet counts per flow. If redundant routing is presents you will see minimum two mac pairs per flow. In that case the counts should be almost equal, if not then something is wrong. Moreover the manufacturer of the interface card is listed, so that the user does not need to look it up on the web. The portClassifier is somewhat misleading, it does not classifier, it transforms the port number into a human readable string, such as port 443 -> https in our case. Now got a quick insight into basic plugins. You can now start using T2 on your own pcaps or look into other tutorials about specifics of traffic mining, or specific plugins. Have fun!! T2 can operate in several operational modes. default is dual IP stack + L2 ETH flow production. In order to accelerate T2 it can be switched into IPv4 or IPv6 mode or only into a plain L2 flow/packet producer depending on your demands or your network. Moreover SCTP to flow transformation is supported. Which is by default disabled, because it adds addition code, the standard admin does not need. The researcher or protocol expert might need that functionality, so set SCTP_ACTIVAT 1. The constant SCTP_STATFINDEX controls whether all SCTP streams sorted into several flows with the same flow Index or different incrementing flow indexes. compile all plugins, as you may have plugins which implement the SCTP flow segregation, e.g. sctpDecode. and run T2 with your sctp pcap. Unfortunately I do not have one for you here which is annonymized. But I’m working on it. You got now a quick insight into T2 functionality, basic plugin opertions and workflow. You can now start using T2 on your own pcaps or look into other tutorials about specifics of your interest. Have fun! !